Now, it has always struck me as an extremely strange decision for SylrePony to adapt Moonstuck as a top-down game, given the puzzle-centric nature of the comic. Perhaps he was getting desperate for an excuse to make an isometric game in Flash, and this method would give him the most exposure out of all his available option, but regardless I'm still kind of weirded out. 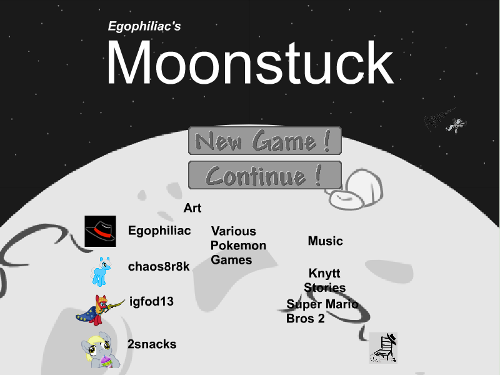 Moonstuck Part 2 begins with a dream sequence inside the observatory, in which the player can either go through a tutorial or a weird "dev" area. The inclusion of the latter is somewhat amusing, but probably not a very good idea since it means the player can skip the tutorial section and thus miss out on a very useful spell that will make your life much easier. After setting sail on an odd-looking boat, you wake up from your nap and things start go to downhill quite rapidly. 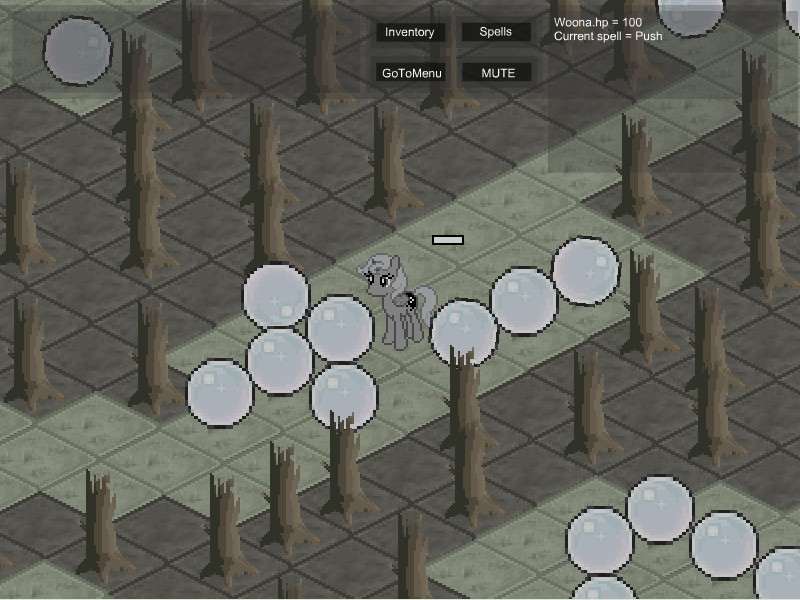 You see, Moonstuck's gameplay consists mostly of wandering around rather bare environments with little idea as to where you are going or what is happening in relation to the plot. On rare occasions you are given a "break" from this monotony by tedious rock smashing and sphere-pushing sessions, which doesn't really help very much at all. Did I mention that in certain puzzles, messing up means walking a long ways back to the previous room, waiting for it to load, then going back and starting all over again? It transforms would-be simple problems into long, drawn-out affairs that quickly get on the player's nerves. ...There isn't much more to say, really, because there isn't much to praise or criticize Moonstuck part 2 for. It's just dull monotony for the entire ride, like taking a road trip during a drought in Saskatchewan, with nothing but dry, flat ground for hundreds of miles. The project's only saving grace is the engine, which looks fairly promising and doubtless could be used for far more interesting projects. To be honest, I feel kind of bad for SylrePony. He's a pretty talented person, but everybody slips up once in a while. Perhaps he'll fix up the game's issues in a future update, and then it should be well-worth revisiting.